Months before, no years before, our adventure commenced, I obsessed over what to take with us – we bought our backpacks 3 years before we actually left. We ended up using it quite well by taking it with us everywhere we went. However, the reality is that our views and perspectives change so much over a period of time, I have decided that what pack to take and what to put in it are not worth agonizing over. When we first selected our backpacks, we endlessly thought and considered between a hiking backpack (top loading) and a travel backpack (front loading). After hours of research, we finally bought the Eagle Creek Explorer LT (Men and Women’s) at the price of $250 each. These packs are no longer produced, but they last to this day and are extremely practical and worth the money. Somewhere along the way, we started enjoying multi day hikes as well and got ourselves hiking backpacks too, so we had a choice in what we could take with us on our trip. Niru’s main backpack – Eagle Creek Explorer LT Women’s version; 50 Litres. Front loading travel pack. No longer under production. Comes with matching 15L day pack, which I did not take, much to my regret. Niru’s other bag – Ebags Piazza day bag. I also carry a foldable REI day pack in my bag. This is a great bag and is very useful for just around town. Can hold a small water bottle, a note book, a kindle and other essentials. 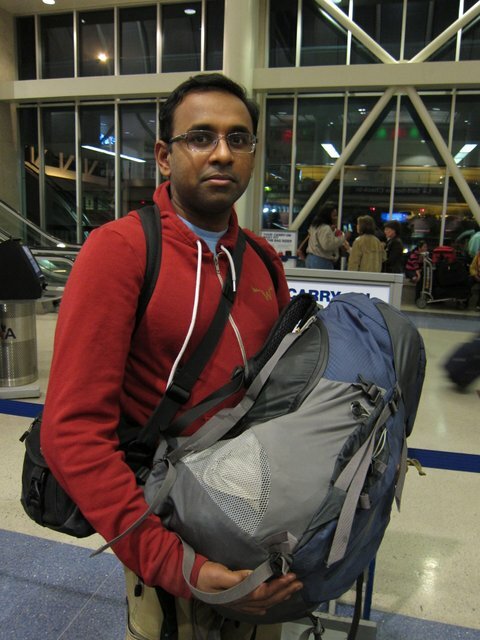 Swami is also carrying an REI daypack and a small camera bag. You may agonize over this endlessly, but in reality, it will not matter what you take. It needs to be something that is comfortable to carry with wide hip belts and good quality shoulder belts. Travel backpacks are easier to pack, but with packing cubes organization is much easier. Hiking packs can take more things than a travel pack – as you tend to stuff more into them and they end up being heavier. They are also easier when your trip involves a multi day trek and you need to carry camping equipment. 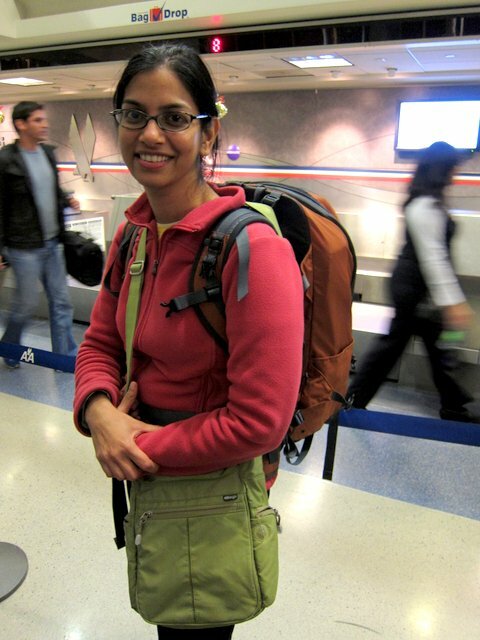 I carried a travel backpack and Swami carried a hiking backpack – neither of us regret our choice even though we did city travel and multi day hikes. We made some not so great choices in this department. Swami’s daypack + camera bag combo did not work for all the gadgets he was carrying (gadgets – a topic by itself). The camera bag shoulder strap dug into his shoulders and did not work well with his main pack. In Colombia we ended up getting another big day pack, which eventually got stolen. I too found the REI day pack very difficult to pack and take on day trips. If I had to do this differently, I would just take the day pack that came with my eagle creek. Somewhere under 20 litres with pockets for small stuff and one big pocket for big stuff will work really well, especially when the day pack is the stand along luggage (for example: Inca Jungle Trek, where we only took a day pack). Packing cubes ROCK! These are our favorite travel accessories. We find the small size and long size ones to be very useful to stuff inside backpacks. I also carried one medium size packing cube in my backpack. We saw a lot of folks carrying enormous backpacks. Ours was one of the smaller ones out there and was often remarked for its size. I found 50 litres to be quite big as I could carry quite a few things in it and found the weight bothersome. In Quito, we shipped quite a few things home and donated some of our clothes too. I found that I could easily have managed with a 40-45 litre backpack and a 15-20 litre daypack.